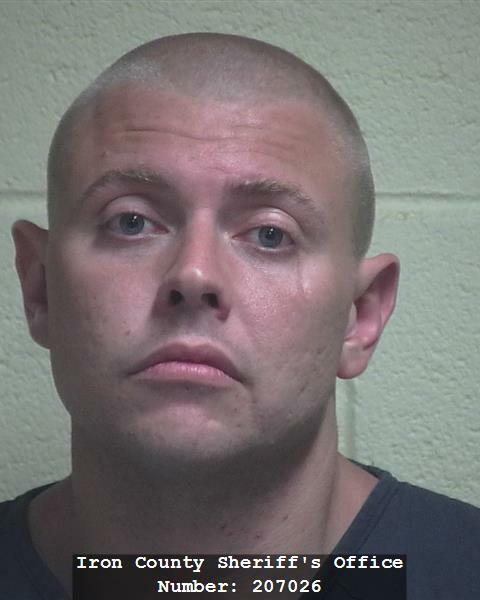 CEDAR CITY – A suspect fleeing Nevada police ran out of gas an hour later while trying to outrun authorities in Iron County Tuesday. The high-speed chase between Iron County Sheriff’s Deputies and Aaron William Jacobsen, 31, ended just west of Newcastle on state Route 56 at milepost 28, Lt. Del Schlosser said. The pursuit for Jacobsen, of Pioche, Nevada, began across the state line. Nevada Highway Patrol chased the suspect for an hour and a half before pulling back 25 miles north of Caliente. About 20 minutes later, Nevada authorities called ahead to Utah and asked for police to be on the lookout for the suspect. Nevada officials believed Jacobsen was on his way to state Route 319, which eventually becomes SR-56 and travels into Iron County, Schlosser said. Deputy Jobe Peterson saw Jacobsen’s vehicle near the junction of state Route 18 and SR-56 and began following him at a safe distance. The suspect was then traveling west but pulled over at milepost 34, making a U-turn to go east. Peterson then began pursuing him with lights and sirens. Speeds reached as high as 105 miles per hour before other deputies arrived in the area and were able to stop the suspect by positioning themselves in a way that blocked his vehicle from moving, Schlosser said. Jacobsen tried to get his car moving again but gave up willingly after realizing he was out of gas. At the time the pursuit was engaged, sheriff’s deputies were acting under information from Nevada authorities that Jacobsen was a suspect wanted in Henderson, Nevada, for his alleged role in a homicide. Police later learned this information was incorrect and that Jacobsen was instead a suspect in a home invasion. The suspect has felony warrants and recent assault charges, Schlosser said. Details on the warrants were not available at publication. Jacobsen was booked into the Iron County Correctional Facility for felony evasion, a third-degree felony, and speeding, a class B misdemeanor. Further details on his arrest were not immediately available.